The ability to turn everyday management practices into learning opportunities is not just the unique gift of a few; it can be taught to willing students. And it starts with mindfulness. Global events over the last several years have raised serious questions about leadership, both in the corporate sector and in the political sphere, and nowhere has this been more painfully evident than in South Africa. From the infamous “state capture” debacle—which saw the embezzlement of billions in public funds through state corruption, often with the active participation of corporate consultants such as KPMG, SAP, and McKinsey—to recent corporate failures such as Steinhoff and VBS Bank that have wiped billions off the Johannesburg Stock Exchange and hit the pockets of some of the most vulnerable members of society, leaders have been deficient, at best. In a country that prides itself on developing exceptional business and political leaders, these failures have tainted South Africa’s reputation. As a larger community, we need to examine what went wrong with our corporate governance to allow this level of corruption to occur. But on a smaller scale, business schools have had to reflect on what we can do to ensure that these lapses don’t happen again. What is our role in making certain that the Guptas, Joostes, and Kirkinis are not the kinds of leaders for which South Africa is known? This is not just a concern for South African business schools, of course. Ethics has been taught in business schools for years—but more often as a footnote. Since the global financial collapse, which was frequently blamed on business schools, there has been a slight rise in the number of institutions that consciously try to encourage a more ethical approach to business, according to a poll by the Financial Times—but whether this is enough to counter the rise of unethical leaders is not clear. The concern is that many of the courses associated with these initiatives only scratch the surface and don’t attempt to delve down to the core of the problem, which is to understand the values that drive our leaders. As part of the EMBA program at the University of Cape Town Graduate School of Business (UCT GSB), we have grappled with this matter extensively. The question is not just about how we produce leaders who will act ethically, but how we produce authentic leaders with purpose. Teaching theory alone is not sufficient. We cannot realistically expect that concepts imparted in the classroom will be effectively applied in practice. Managers don’t operate in isolation from the activity around them, where they can employ abstract, rational thinking to consider their options and choose the most applicable theory. They work in situations that require constant adjustments and adaptations rather than pre-conceived plans. How they respond to these pressures depends in large part on their value system and how they position themselves alongside those values. In other words, we can teach theory, but we can’t teach wisdom. That only comes from practice, experience, and reflection. It comes from experimentation, refining methods, and being able to evaluate whether the desired outcome was achieved. Fortunately, this ability to turn everyday management practices into learning opportunities is not just the unique gift of a few; it can be taught to willing students. And it starts, crucially, with mindfulness. That might have sounded quite New Age some years ago, but the practice of mindfulness has now become mainstream in the business world, and the UCT GSB was among the first to integrate it into the EMBA curriculum almost a decade ago. We remain one of just a handful of schools where mindfulness is a compulsory course for students, as opposed to an elective. Simply put, mindfulness is keeping your mind fully focused on what is currently happening to you, what you are doing, and where you are, as much as possible without judging your circumstances or behaviors. With this level of attentiveness comes the ability to observe what you are thinking or feeling, as well as a greater inquisitiveness about where each action leads. Mindfulness has taken the world by storm and has inevitably brought with it a certain amount of phoneyism as people rush to get in on the act, hoping, often, that mindfulness can boost productivity in difficult economic times. However, productivity—while a possible by-product—is not in fact the main benefit of mindfulness in the workplace. According to a metastudy by Daniel Goleman, co-director of the Consortium for Research on Emotional Intelligence in Organizations at Rutgers University, and University of Wisconsin neuroscientist Richard Davidson, there are four tangible and proven benefits from mindfulness training as it applies in the workplace. These include stronger focus, staying calmer under stress, better memory, and good corporate citizenship. Because mindful leaders are better able to regulate their emotions than leaders without a mindfulness practice, they are less reactive and more responsive, and they adapt more quickly as situations change. They are more likely to be aware when things are uncomfortable or not working out as planned and can temper their reactions; they learn instead to respond more creatively. “Mindfulness teaches people how to be present to discomfort and uncertainty in complex work environments. They are more able to tolerate uncomfortable emotions without reacting impulsively, and over time they develop more resilience in the face of pressurized workplaces and challenging workplace dynamics,” says Linda Kantor, a psychologist and mindfulness trainer who teaches the subject as part of the EMBA at the UCT GSB. Mindful leaders are also—and this is critical—far more authentic. It is this attribute that enables executives to become better corporate citizens. When people are more authentic, there is a direct correlation between what they are feeling and what they are doing and saying. They are also more deliberate about their actions. Authentic leaders don’t allow their judgment to be clouded by overconfidence. They don’t resort to misleading or manipulating those around them for self-glorification. And they don’t defraud the public. Goleman and Davidson link this to the fact that many meditation practices intentionally cultivate an attitude of kindness in addition to just a focus on attention on a particular object. This approach has been shown to lead to more activity in brain circuits for caring, increased generosity, and a greater likelihood of helping someone in need, qualities of the best corporate citizens—and of the leaders people prefer to work for. Few would disagree that these are the kinds of leaders South Africa—and the world—needs, and within the EMBA program, we are seeking to support the emergence of more empathetic and responsible leaders by introducing students to the practice of mindfulness. In addition, we invite them to reflect on their understanding of mundane, everyday management practices and whether these can be turned into opportunities for personal growth. Philosophers would call this “being” and “becoming”—phrases that are likely to make their way into everyday business language in much the same way mindfulness has. Our approach, which we named phronesis development practices (PDP) from the ancient Greek term for “practical wisdom,” requires that students contemplate their moods, tensions, and personal practices each day. The goal is to make value rationality, or ethics, a habitual mindful practice in which students engage routinely—to encourage them to search for individual and collective good and locate the multiple ways it can arise. To help them achieve this habit, we introduce students to a range of different meditation practices (body scan, sitting meditation, walking meditation, and movement meditation) and encourage them to find one they can adopt. The important thing, says Kantor, is to have a daily practice—even if it is short. Although, as the Greater Good Science Center at the University of California, Berkley points out, the more you practice, the more you benefit. The first thing we encounter when introducing these ideas to students, most of whom are experienced and busy business practitioners, is that they have to first overcome their resistance to slowing down at all. And we spend a lot of time addressing misconceptions about what mindfulness and meditation practice are. The second thing students find out is that regular mindfulness practice is hard to sustain; it is not always easy to find the time. But that recognition alone is the start of an important reflection because students are confronted with how incessant their lives are. Over time, a daily practice can lend itself to deeper reflections about unnecessary or unhelpful habits that leaders can do without and that often are the cause of unnecessary friction in the workplace. Students also start to see that these old behavioral patterns do not relate just to the workplace but spill over into their whole lives—even into family holidays. As students’ reflections become deeper, they learn more about themselves and how they operate. According to student feedback, by reflecting and recalibrating each day, students grow more aware of the choices they make and the values that inform their conduct. They also become more conscious of their strengths and weaknesses. Even more significant an outcome, students discover they are less likely to simply take the quick and easy way out of a problem. Their actions over time are more deliberate—and more authentic. 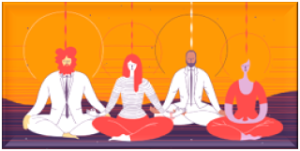 Of course, mindfulness will not solve all of our leadership challenges, but a new generation of executives willing to cultivate the discipline of paying attention and adopt new practices may encourage a very different approach from business in future.